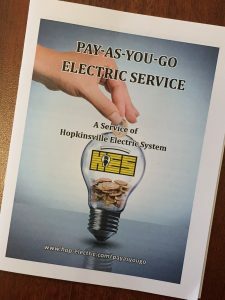 A new pamphlet is available from HES describing the Pay-As-You-Go program. This pamphlet explains how the Pay-As-You-Go program works, how to sign up, and answers many of the questions customers ask us about the program. This pamphlet is available to any HES customer interested in the Pay-As-You-Go program, or any customer already enrolled in the program. The pamphlet may be picked up at the HES office any time during normal business hours. Additional information is available on the HES website by clicking here.